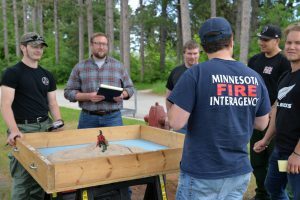 During today’s Minnesota Wildfire Academy activities, students in the “Incident within an Incident” course tested their skill and knowledge by performing a simulated field exercise. 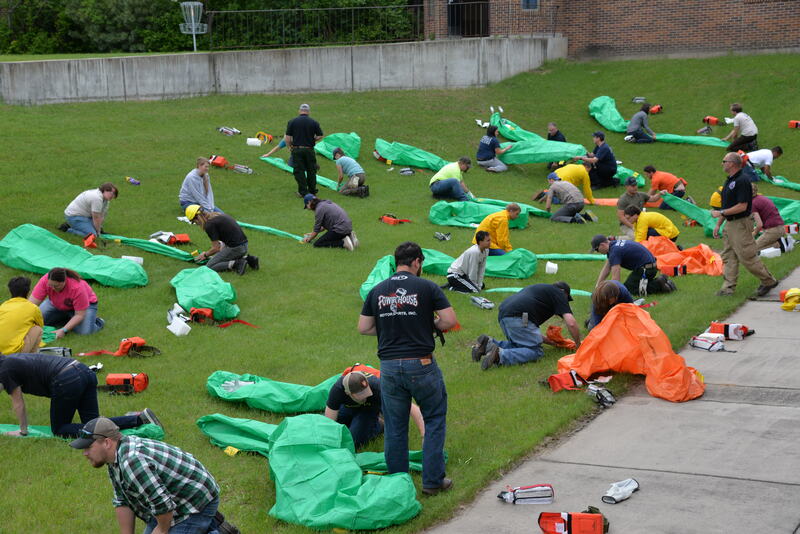 The mock exercise required support and collaboration from numerous agencies including Life Link III Emergency Medical Services Air Ambulance, Minnesota State Patrol and Minnesota Department of Natural Resources Divisions of Forestry and Enforcement. In the exercise, students used the incident command system to respond to a mock firefighting emergency. On-the- ground firefighters could not locate the injured person, so they brought in a fixed-wing aircraft to provide aerial supervision and helicopters to grid the search area and locate the role-player. Students applied critical thinking and teamwork skills when the scenario drastically changed to a life-threatening medical emergency. Using a short-haul helicopter, the mock patient was lifted out of the remote, wooded area and flown to the awaiting air ambulance. During and exercise in the Incident Within an Incident course, the Minnesota State Patrol short-haul helicopter was used to rescue an injured firefighter. 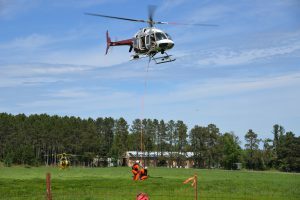 The simulation also used a LifeLine helicopter, two Minnesota Department of Natural Resources (DNR) helicopters and a DNR fixed wing aircraft. Instructors from Arizona developed the “Incident within an Incident” course and coordinated the exercise with Academy aircraft staff. This is the 18th year of the Minnesota Wildfire Academy. Nearly 700 students and incident personnel are participating in 32 courses. These courses range from basic fire-fighting to power saws, from intermediate fire behavior to aircraft dispatch to firing operations. 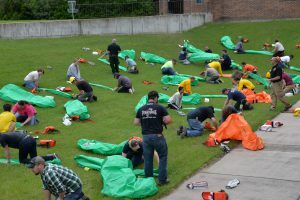 The academy is held at Itasca Community College, located in Grand Rapids, Minn.
Students in the basic firefighting class practice deploy fire shelters within 35 seconds. In the Firing Operations class, instructors demonstrate equipment used to ignite fires. A sand table exercise gives students an opportunity to determine how they would respond to fires in the Engine Boss class. 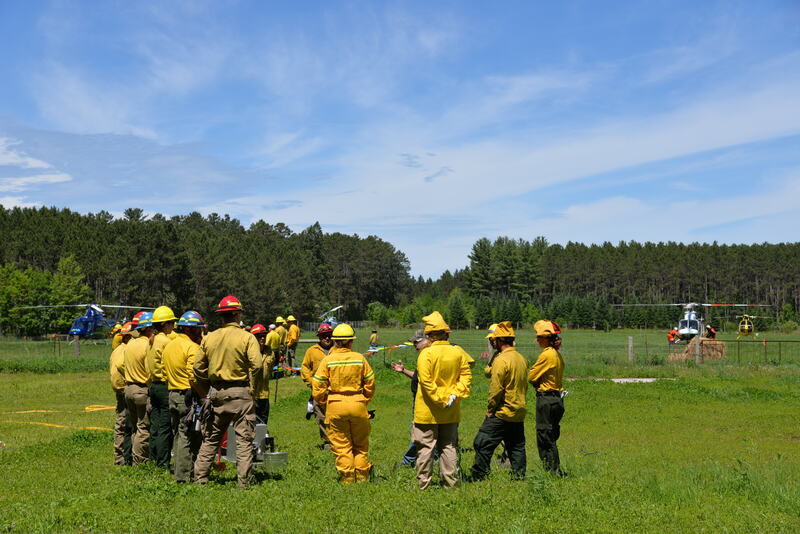 Wildfire Academy, June 5, 2018.